Families of children resting in Durrington Cemetery have been left ‘gobsmacked and heartbroken’ over attempts to remove tributes from the children’s section. In a letter dated January 24, pinned to a fencepost, Worthing Borough Council said tributes not directly on graves would be removed from the ‘unkempt’ cemetery. Clifford Marsh’s granddaughter, Scarlett, rests in the cemetery and he voiced his horror at the decision. “This has left me and my group gobsmacked and heartbroken,” he said. 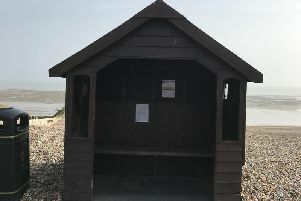 “Many of us are regular visitors to the children’s cemetery at Durrington, for sad and obvious reasons, and a number of my group have sent me pictures of their children’s resting areas. The letter stated the removal of tributes was planned for February 25. Several commenters in a Facebook community group said a month’s notice was not enough. A council spokesman said: “We are endeavouring as sensitively as possible and in consultation with relatives to have a tidy up of the site after feedback that it was beginning to look a little unkempt.